Check out this long flap crochet bag pattern...can't you just see yourself carrying this on your shoulder? It has plenty of room inside, as the finished size is 12" wide x 11.5" high x 7" deep. You know you have some fun fur or other eyelash yarn you need to find a use for...well now you've found it. 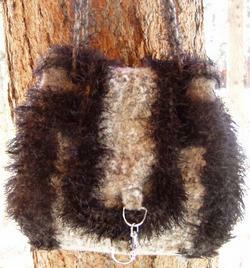 This bag is worked in Moda Dea Cache, New Zealand Naturally and Lion Brand Fun Fur. If you don't have these then you can trade them out for a worsted/bulky weight wool and any kind of eyelash which goes with your color choices. It's an easy pattern, but don't I always say that? It also has quite a different closure from other bags, adding a little interest there. As I'm sure you'll have noticed this crochet bag is felted, making it both sturdy and functional. Easy care - you can just toss this felted crochet bag into a regular warm wash once it's fully felted. Each twisted cord or rope style handle is approximately 40" long, which means the bag will sit comfortably between your waist and hip. 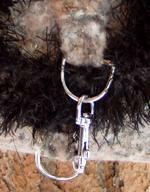 Handles can be made shorter or longer to your personal style. Options are also given for making thicker handles. All in all an eyecatching piece of shoulder wear. Try this long flap crochet bag pattern out for yourself right now. Just click on the "Buy Now" button, pay, download to your computer and be crocheting your own bag in no time at all. This pattern is available for immediate download as a PDF file. You will need Adobe Acrobat installed on your computer in order to receive and access this PDF file. You can download a free copy of Adobe Acrobat here. Download time may vary depending on the speed of your internet connection. 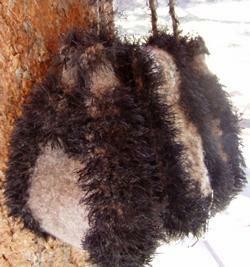 Return to Felted Wool Purses from Long Flap Crochet Bag Pattern. Copyright 2006 - 2012 Woolcrafting.com - All Rights Reserved.